For the past year La Serenissima have been performing a series of concerts based on music from different cities in Italy. This CD, recorded in St John’s, Smith Square after one such concert, forms a summary of the extraordinary music from that concert series. the cities, and composers, represented are Venice (Albinoni, Caldara, Vivaldi), Bologna (Torelli), Padua (Tartini) and Rome (Corelli). Apart from some glorious music, one of the features of this recording is the instrumental colour, with prominent roles for oboes, bassoons, trumpets, trombone, timpani and strings. The music is played with La Serenissima’s characteristic boldness and panache, with a strong rhythmic pulse. It all makes for an exciting edge-of-the-seat tour around Italy. Corelli’s Sinfonia to Santa Beatrice d’Este is given a particularly powerful performance, most noticeably in the very strong opening transients of the opening violin. Led by a violin soloist, Adrian Chandler’s own playing obviously makes its presence felt, both in performance and in recording focus. Peter Whelan’s playing in the Vivaldi Concerto in C for bassoon is brilliant, the tones of the bassoon varying from earthy to sensuous. Equally impressive are oboists Rachel Chaplin and Gail Hennessy in the solo roles. 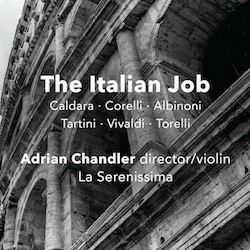 The concluding Torelli Sinfonia for four trumpets, trombone, timpani, 2 oboe, 2 bassoons et al make the powerful sound that you would expect from such a line-up, and nicely balances the equally powerful, but rather less predictably crafted opening Caldara Sinfonia, with its use of just two trumpets.